Often after dinner, on a pleasant summer’s night, we like to jump onto the pontoon boat and head out for an evening cruise. The sun is low in the sky, the light is perfect, the air has cooled and the water is calm. 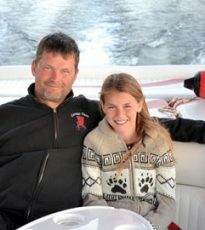 The whole family climbs aboard, (except the dog – who thinks that anything done in or on the water is an act of supreme folly), and we tour along the south shore of are lake to do some cottage watching. I love to see what people are doing at their places, the projects that they are working on; the new docks, swim rafts, gazebos and in-law suites that are being built. Cottagers who are enjoying the last of the day’s sun out on their dock will give us a wave, and we return the gesture. After cruising along the shoreline for some time I will rev up the motor and circle back amongst the islands, checking to see what friends and neighbours are up at their cottages. We might take a little detour up the uninhabited north arm, perhaps shutting down the engine and drifting awhile with a fishing line in the water. Then we will head back home along the north shore before circling back to our place. What a wonderful way to spend an evening. In the spring and fall, when Big Red is not in use at the cottage, we often take the boat out to investigate Muskoka lakes or the local canals and waterways. We have a small barbecue on board for shore lunches, and attach our kayaks or bikes on hooks off the bow for exploring on route. Yes, that is me, drifting past in “Big Red” staring in at you – doing the same thing that sometimes annoys me at our place. “You’ve gone and bought a party boat!” my dad says accusingly. My dad doesn’t like change at the best of times. This is especially true at the cottage, which my folks had owned for some 30 years before we purchased it from them. If a Bowrider runabout and a leaky canoe had been good enough for him for all those years, what need did I have for this pontoon monstrosity? I had thought that this boat would be better for my aging parents to get on and off, better than stepping in and out of the deep, low-riding v-haul Invader. I don’t think I have to tell you that it is a mistake to mention this though. “We aren’t cripples you know,” says my dad. No, this is certainly true; my folks are really quite agile for individuals in their 80’s … but really? I notice that my mother is not complaining. Rather she seems to be admiring the cushy lounge area at the stern of the boat; much like my wife and daughters had done earlier. I had meant this purchase, our first major one since buying the cottage, to be a surprise for my parents. 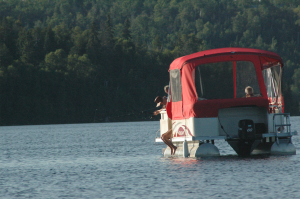 They were coming to the cottage for a visit, and I had proudly headed over to the landing to retrieve them behind the wheel of “Big Red,” my shiny new pontoon boat. I’m not sure I had expected praise, but neither was I prepared to get admonished. Through that summer, the pontoon boat proves its worth time and time again, especially when the cottage becomes a busy place. It is particularly valuable because our cabin sits a kilometre and a half offshore on a three acre island. It simplifies ferrying people and gear back and forth from the mainland. A family of six and their provisions can be hauled in one trip. When we have a cottage project on the go, it helps transport lumber and supplies. The large vessel adds extra outdoor living space when attached to the dock, a comfortable sitting area for lunch or for the revelry of the cocktail hour. When we zip in the half enclosure, the boat becomes a bunkie, an added sleeping space for extra guests. Quite often we run up the lake at midday, beaching the boat on the beautiful crescent of sand that rings a bay on our lake’s north shore. The kids frolic around in the shallow waters, build castles in the fine pink sand, or snorkel around the rocky outcrops that protect the beach. We start a driftwood bonfire and roast hot dogs on willow sticks. It is the end of the cottage season and the extended family is at the lake. 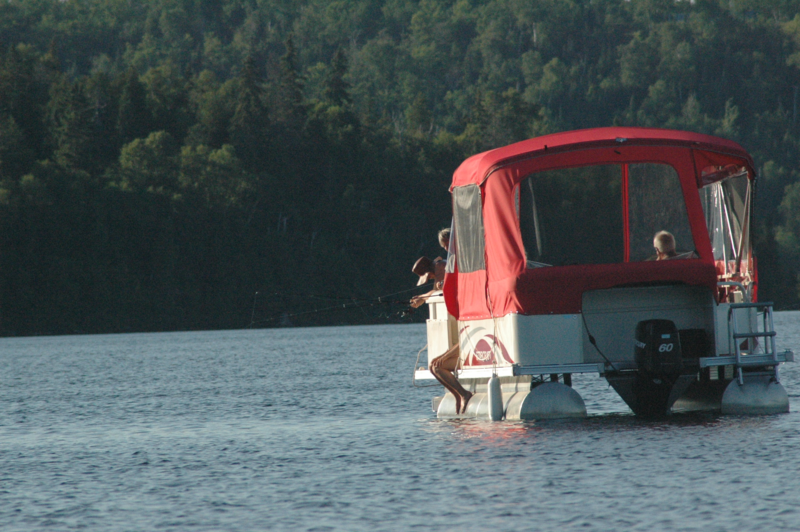 I plan to haul the pontoon boat home after this Labour Day long weekend. During our last night, we are surprised to hear music echoing across the water from the resort on the South shore. Not totally happy that our evening’s peace and quiet is being compromised, but also intrigued, we decide to hop on the boat and cruise over to investigate. I navigate our vessel into the bay where a river outlets our lake, and where the local resort is hidden and protected. We are surprised to see a live band playing on the large wooden front deck of the lodge, and a throng of people milling about under patio lanterns. I shut down the engine and we drift in the bay with our deck lights reflecting softly off the still water. The band is unexpected, but good, and we find ourselves singing along to the familiar tunes, tapping our feet and clapping and hooting after each song. The band acknowledges us – the boaters in the bay, and I toot the horn in response. Suddenly, as they break into a slow, fifties love song, my dad and mom stand and begin a slow waltz around the deck. It is a beautiful scene, under a canopy of stars, with the sparkling lake water shimmering around us. Loud applause comes from the people on shore.